These popular Petunias have colourful flowers which will bring a lot of interest throughout the Summer. This variety has a mix of pink, red, purple and white blooms with dark centres which will trail spectacularly (will trail up to 40cm!) 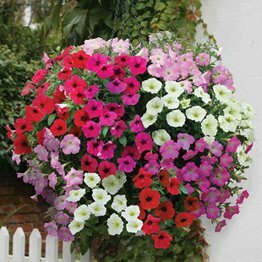 over the sides of your hanging baskets from May until the first frosts. WILL BE DISPATCHED MID MARCH. PLUGS ARE 4 TO 6 CM (HEIGHT IS MEASURED FROM BASE OF ROOT TO TOP OF PLANT).